A Hebrew word signifying "refusal, denial, or protest"; used technically by the Rabbis to denote a woman's protest against a marriage contracted for her during her minority; also the annulment of such a marriage. A marriage contracted for a girl minor by her father was regarded as valid; and it necessitated the formality of a divorce if separation was desired (see Daughter; Majority; Marriage). 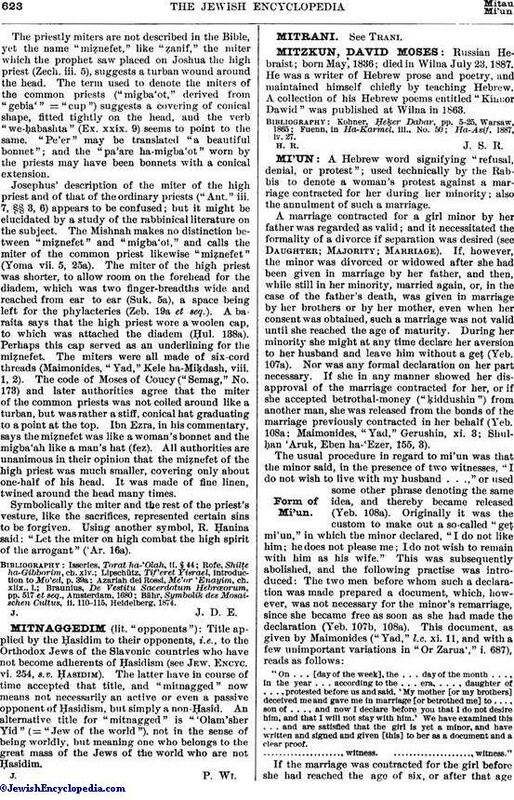 If, however, the minor was divorced or widowed after she had been given in marriage by her father, and then, while still in her minority, married again, or, in the case of the father's death, was given in marriage by her brothers or by her mother, even when her consent was obtained, such a marriage was not valid until she reached the age of maturity. During her minority she might at any time declare her aversion to her husband and leave him without a geṭ (Yeb. 107a). Nor was any formal declaration on her part necessary. If she in any manner showed her disapproval of the marriage contracted for her, or if she accepted betrothal-money ("ḳiddushin") from another man, she was released from the bonds of the marriage previously contracted in her behalf (Yeb. 108a; Maimonides, "Yad," Gerushin, xi. 3; Shulḥan 'Aruk, Eben ha-'Ezer, 155, 3). "On . . . [day of the week], the . . . day of the month . . ., in the year . . . according to the . . . era, . . . , daughter of . . . , protested before us and said, 'My mother [or my brothers] deceived me and gave me in marriage [or betrothed me] to . . . , son of . . . , and now I declare before you that I do not desire him, and that I will not stay with him.' We have examined this . . . and are satisfied that the girl is yet a minor, and have written and signed and given [this] to her as a document and a clear proof. ...................., witness. ...................., witness." If the marriage was contracted for the girl before she had reached the age of six, or after that agewithout her consent, the formality of mi'un was not necessary. If the marriage took place with her consent when she was between the ages of six and ten, mi'un was necessary if she showed signs of intelligence and of appreciation of the symbols of marriage. After ten, mi'un was necessary even if the girl manifested no signs of intelligence (Yeb. 107b; Giṭ. 65a; "Yad," l.c. xi. 7; Eben ha-'Ezer, 155, 2). Since mi'un was regarded as an annulment of marriage, and not merely as a separation, like divorce, the girl might afterward marry any of the relatives of her presumptive husband, and he any of her relatives. She might marry a kohen, or might remarry her previous husband, even though she had been married to another after mi'un (Yeb. 108a; "Yad," l.c. xi. 16, 17; Eben ha-'Ezer, 155, 10; see Divorce). The institution of mi'un seems to have been of very early origin. The Rabbis speak of it as a wellestablished custom, although some of them look upon it with disfavor. Bet Shammai restricted mi'un to betrothed minors, and prohibited it after marriage had already taken place (Yeb. 107a). Bar Ḳappara includes mi'un among the things which one should avoid (ib. 109a); and one is therefore advised against associating oneself with witnesses for the purposes of mi'un ("Yad," l.c. x. 16). 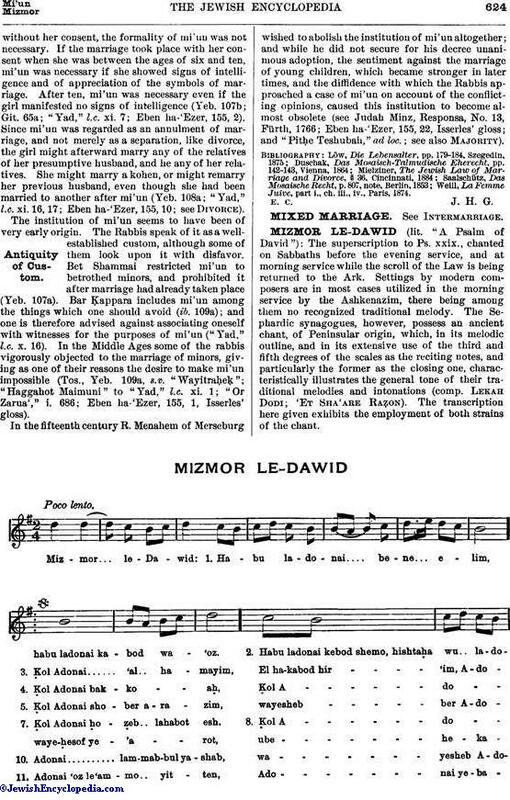 In the Middle Ages some of the rabbis vigorously objected to the marriage of minors, giving as one of their reasons the desire to make mi'un impossible (Tos., Yeb. 109a, s.v. " Wayitraḥeḳ"; "Haggahot Maimuni" to "Yad," l.c. xi. 1; "Or Zarua'," i. 686; Eben ha-'Ezer, 155, 1, Isserles' gloss). In the fifteenth century R. Menahem of Merseburg wished to abolish the institution of mi'un altogether; and while he did not secure for his decree unanimous adoption, the sentiment against the marriage of young children, which became stronger in later times, and the diffidence with which the Rabbis approached a case of mi'un on account of the conflicting opinions, caused this institution to become almost obsolete (see Judah Minz, Responsa, No. 13, Fürth, 1766; Eben ha-'Ezer, 155, 22, Isserles' gloss; and "Pitḥe Teshubah," ad loc. ; see also Majority). Weill, La Femme Juive, part i., ch. iii., iv., Paris, 1874.